Neurons and glia coordinate actions and transmit signals in the CNS and PNS. The central nervous system contains the brain and spinal cord; the peripheral nervous system consists of nerves, motor neurons, the autonomic nervous system, and the enteric nervous system. The nervous system coordinates the voluntary and involuntary actions of the body by transmitting signals from the brain to the other body parts and listening for feedback. Nervous systems vary across different animals; some invertebrates lack a true nervous system or true brain, while other invertebrates have a brain and a system of nerves. Unlike vertebrates, not all invertebrates have both a CNS and PNS; their nerve cords are located ventrally rather than dorsally. The functions of the nervous system are performed by two types of cells: neurons, which transmit signals between them and from one part of the body to another, and glia, which regulate homeostasis, providing support and protection to the function of neurons. The nervous system coordinates the body’s voluntary and involuntary actions and transmits signals between different parts of the body. Nervous tissue first arose in wormlike organisms approximately 550 to 600 million years ago. In most types of vertebrate animals, it consists of two main parts: the central nervous system (CNS) and the peripheral nervous system (PNS). The CNS contains the brain and spinal cord. The PNS consists mainly of nerves, which are long fibers that connect the CNS to every other part of the body. The PNS includes motor neurons (mediating voluntary movement), the autonomic nervous system (comprising the sympathetic nervous system and the parasympathetic nervous system, which regulate involuntary functions), and the enteric nervous system (a semi-independent part of the nervous system whose function is to control the gastrointestinal system). The nervous system performs several functions simultaneously. For example, as you are reading, the visual system is processing what is seen on the page; the motor system controls the turn of the pages (or click of the mouse); the prefrontal cortex maintains attention. Even fundamental functions, like breathing and regulation of body temperature, are controlled by the nervous system. A nervous system is an organism’s control center: it processes sensory information from outside (and inside) the body and controls all behaviors, from eating to sleeping to finding a mate. Nervous system at work: An athlete’s nervous system is hard at work during the planning and execution of a movement as precise as a high jump. Parts of the nervous system are involved in determining how hard to push off and when to turn, as well as controlling the muscles throughout the body that make this complicated movement possible without knocking the bar down; all in just a few seconds. Nervous systems throughout the animal kingdom vary in structure and complexity. Some organisms, such as sea sponges, lack a true nervous system. Others, such as jellyfish, lack a true brain. Instead, they have a system of separate-but-connected nerve cells (neurons) called a “nerve net.” Echinoderms, such as sea stars, have nerve cells that are bundled into fibers called nerves. Flatworms of the phylum Platyhelminthes have both a central nervous system, made up of a small “brain” and two nerve cords, and a peripheral nervous system containing a system of nerves that extend throughout the body. The insect nervous system is more complex, but also fairly decentralized. It contains a brain, ventral nerve cord, and ganglia (clusters of connected neurons). These ganglia can control movements and behaviors without input from the brain. Octopi may have the most complicated of invertebrate nervous systems. They have neurons that are organized in specialized lobes and eyes that are structurally similar to vertebrate species. Various nervous systems: (a) In cnidarians, nerve cells form a decentralized nerve net. (b) In echinoderms, nerve cells are bundled into fibers called nerves. (c) In animals exhibiting bilateral symmetry, such as planarians, neurons cluster into an anterior brain that processes information. (d) In addition to a brain, arthropods have clusters of nerve cell bodies, called peripheral ganglia, located along the ventral nerve cord. Mollusks, such as squid and (e) octopi, which must hunt to survive, have complex brains containing millions of neurons. In (f) vertebrates, the brain and spinal cord comprise the central nervous system, while neurons extending into the rest of the body comprise the peripheral nervous system. Compared to invertebrates, vertebrate nervous systems are more complex, centralized, and specialized. While there is great diversity among different vertebrate nervous systems, they all share a basic structure: a CNS and a PNS. One interesting difference between the nervous systems of invertebrates and vertebrates is that the nerve cords of many invertebrates are located ventrally (near the abdomen), whereas the vertebrate spinal cords are located dorsally (near the back). There is debate among evolutionary biologists as to whether these different nervous system plans evolved separately or whether the invertebrate body plan arrangement somehow “flipped” during the evolution of vertebrates. The nervous system is made up of neurons, specialized cells that can receive and transmit chemical or electrical signals, and glia, cells that provide support functions for the neurons by playing an information processing role that is complementary to neurons. A neuron can be compared to an electrical wire: it transmits a signal from one place to another. Glia can be compared to the workers at the electric company who make sure wires go to the right places, maintain the wires, and take down wires that are broken. Although glial cells support neurons, recent evidence suggests they also assume some of the signaling functions of neurons. Four major types of neurons transmit signals through the body via specialized structures such as dendrites, axons, and synapses. Dendrites are the tree-like structures in neurons that extend away from the cell body to receive messages from other neurons at synapses; not all neurons have dendrites. Synapses enable the dendrites from a single neuron to interact and receive signals from many other neurons. Axons are tube-like structures that send signals to other neurons, muscles, or organs; not all neurons have axons. 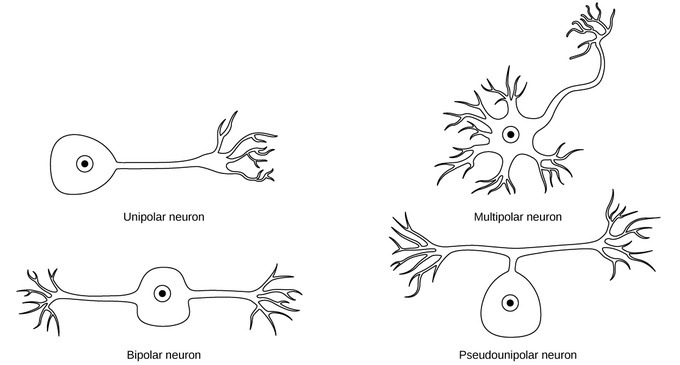 Neurons are divided into four major types: unipolar, bipolar, multipolar, and pseudounipolar. Unipolar neurons have only one structure extending from the soma; bipolar neurons have one axon and one dendrite extending from the soma. Multipolar neurons contain one axon and many dendrites; pseudounipolar neurons have a single structure that extends from the soma, which later branches into two distinct structures. The nervous system of the common laboratory fly, Drosophila melanogaster, contains around 100,000 neurons, the same number as a lobster. This number compares to 75 million in the mouse and 300 million in the octopus. A human brain contains around 86 billion neurons. Despite these very different numbers, the nervous systems of these animals control many of the same behaviors, from basic reflexes to more complicated behaviors such as finding food and courting mates. The ability of neurons to communicate with each other, as well as with other types of cells, underlies all of these behaviors. Most neurons share the same cellular components. But neurons are also highly specialized: different types of neurons have different sizes and shapes that relate to their functional roles. Each neuron has a cell body (or soma) that contains a nucleus, smooth and rough endoplasmic reticulum, Golgi apparatus, mitochondria, and other cellular components. Neurons also contain unique structures, relative to most cells, which are required for receiving and sending the electrical signals that make neuronal communication possible. Dendrites are tree-like structures that extend away from the cell body to receive messages from other neurons at specialized junctions called synapses. While some neurons have no dendrites, other types of neurons have multiple dendrites. Dendrites can have small protrusions called dendritic spines, which further increase surface area for possible synaptic connections. Cellular structure of neurons: Neurons contain organelles common to many other cells, such as a nucleus and mitochondria. They also have more specialized structures, including dendrites and axons. Once a signal is received by the dendrite, it then travels passively to the cell body. The cell body contains a specialized structure, the axon hillock, that integrates signals from multiple synapses and serves as a junction between the cell body and an axon: a tube-like structure that propagates the integrated signal to specialized endings called axon terminals. These terminals, in turn, synapse on other neurons, muscles, or target organs. Chemicals released at axon terminals allow signals to be communicated to these other cells. Neurons usually have one or two axons, but some neurons, like amacrine cells in the retina, do not contain any axons. Some axons are covered with myelin, which acts as an insulator to minimize dissipation of the electrical signal as it travels down the axon, greatly increasing the speed on conduction. This insulation is important as the axon from a human motor neuron can be as long as a meter: from the base of the spine to the toes. The myelin sheath is not actually part of the neuron. Myelin is produced by glial cells. Along these types of axons, there are periodic gaps in the myelin sheath. These gaps, called “nodes of Ranvier,” are sites where the signal is “recharged” as it travels along the axon. It is important to note that a single neuron does not act alone. Neuronal communication depends on the connections that neurons make with one another (as well as with other cells, such as muscle cells). Dendrites from a single neuron may receive synaptic contact from many other neurons. For example, dendrites from a Purkinje cell in the cerebellum are thought to receive contact from as many as 200,000 other neurons. There are different types of neurons; the functional role of a given neuron is intimately dependent on its structure. There is an amazing diversity of neuron shapes and sizes found in different parts of the nervous system (and across species). Neuron diversity: There is great diversity in the size and shape of neurons throughout the nervous system. Examples include (a) a pyramidal cell from the cerebral cortex, (b) a Purkinje cell from the cerebellar cortex, and (c) olfactory cells from the olfactory epithelium and olfactory bulb. While there are many defined neuron cell subtypes, neurons are broadly divided into four basic types: unipolar, bipolar, multipolar, and pseudounipolar. Unipolar neurons have only one structure that extends away from the soma. These neurons are not found in vertebrates, but are found in insects where they stimulate muscles or glands. A bipolar neuron has one axon and one dendrite extending from the soma. An example of a bipolar neuron is a retinal bipolar cell, which receives signals from photoreceptor cells that are sensitive to light and transmits these signals to ganglion cells that carry the signal to the brain. Multipolar neurons are the most common type of neuron. Each multipolar neuron contains one axon and multiple dendrites. Multipolar neurons can be found in the central nervous system (brain and spinal cord). The Purkinje cell, a multipolar neuron in the cerebellum, has many branching dendrites, but only one axon. Pseudounipolar cells share characteristics with both unipolar and bipolar cells. A pseudounipolar cell has a single structure that extends from the soma (like a unipolar cell), which later branches into two distinct structures (like a bipolar cell). Most sensory neurons are pseudounipolar and have an axon that branches into two extensions: one connected to dendrites that receives sensory information and another that transmits this information to the spinal cord. Types of Neurons: Neurons are broadly divided into four main types based on the number and placement of axons: (1) unipolar, (2) bipolar, (3) multipolar, and (4) pseudounipolar. The seven types of glia have specific functions that play a role in supporting neuron function. Glia guide developing neurons to their destinations, buffer harmful ions and chemicals, and build the myelin sheaths around axons. In the CNS astrocytes provide nutrients to neurons, give synapses structural support, and block toxic substances from entering the brain; satellite glia provide nutrients and structural support for neurons in the PNS. Microglia scavenge and degrade dead cells, protecting the brain from invading microorganisms. Oligodendrocytes form myelin sheaths around axons in the CNS; Schwann cell forms myelin sheaths around axons in the PNS. Radial glia serve as bridges for developing neurons as they migrate to their end destinations. Ependymal cells line fluid-filled ventricles of the brain and central canal of the spinal cord which produce cerebrospinal fluid. While glia (or glial cells ) are often thought of as the supporting cast of the nervous system, the number of glial cells in the brain actually outnumbers the number of neurons by a factor of ten. Neurons would be unable to function without the vital roles that are fulfilled by these glial cells. Glia guide developing neurons to their destinations, buffer ions and chemicals that would otherwise harm neurons, and provide myelin sheaths around axons. Scientists have recently discovered that they also play a role in responding to nerve activity and modulating communication between nerve cells. When glia do not function properly, the result can be disastrous; most brain tumors are caused by mutations in glia. 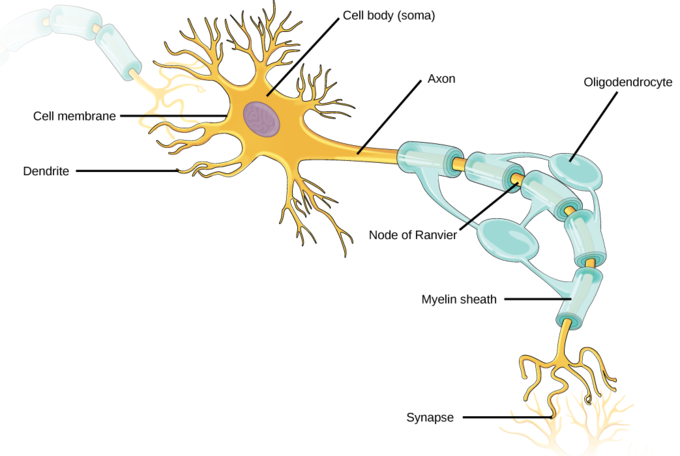 There are several different types of glia with different functions. Astrocytes make contact with both capillaries and neurons in the CNS. They provide nutrients and other substances to neurons, regulate the concentrations of ions and chemicals in the extracellular fluid, and provide structural support for synapses. Astrocytes also form the blood-brain barrier: a structure that blocks entrance of toxic substances into the brain. They have been shown, through calcium-imaging experiments, to become active in response to nerve activity, transmit calcium waves between astrocytes, and modulate the activity of surrounding synapses. Satellite glia provide nutrients and structural support for neurons in the PNS. Microglia scavenge and degrade dead cells, protecting the brain from invading microorganisms. Oligodendrocytes form myelin sheaths around axons in the CNS. One axon can be myelinated by several oligodendrocytes; one oligodendrocyte can provide myelin for multiple neurons. This is distinctive from the PNS where a single Schwann cell provides myelin for only one axon as the entire Schwann cell surrounds the axon. Radial glia serve as bridges for developing neurons as they migrate to their end destinations. Ependymal cells line fluid-filled ventricles of the brain and the central canal of the spinal cord. They are involved in the production of cerebrospinal fluid, which serves as a cushion for the brain, moves the fluid between the spinal cord and the brain, and is a component for the choroid plexus. Images of glial cells: (a) Astrocytes and (b) oligodendrocytes are glial cells of the central nervous system. Glial cells: Glial cells support neurons and maintain their environment. Glial cells of the (a) central nervous system include oligodendrocytes, astrocytes, ependymal cells, and microglial cells. Oligodendrocytes form the myelin sheath around axons. Astrocytes provide nutrients to neurons, maintain their extracellular environment, and provide structural support. Microglia scavenge pathogens and dead cells. Ependymal cells produce cerebrospinal fluid that cushions the neurons. Glial cells of the (b) peripheral nervous system include Schwann cells, which form the myelin sheath, and satellite cells, which provide nutrients and structural support to neurons.